that want to edit their listing. You DO NOT need a user name or password to search or register for real Estate Sales. Welcome to uSELLaHOME.com, the For Sale by Owner, FSBO service. Many people are not happy with their current residence. Maybe it's too far from their place of work, too large, too small, for a myriad of reasons people want to move, but because of the huge expense of real estate fees they remain where they are. The solution? Sell your home by owner and save those horrific fees, which can take as much as 7% of your hard earned equity. How easy is it to sell on your own? Just ask Bianca, an elderly lady, and a uSELLaHOME.com customer, who sold her home in 1 week, and she put in her pocket $2,000 more than the suggested price a realtor indicated her home should sell for. "It was so easy to sell my own home, I can't believe everyone doesn't do this." Not only did she sell her home utilizing our services, she also purchased her present home from the uSELLaHOME.com web site. She will soon be selling this home as well, with the help of uSELLaHOME.com, and like her last home, she will keep all of the profits in her pocket and not share them with a realtor. 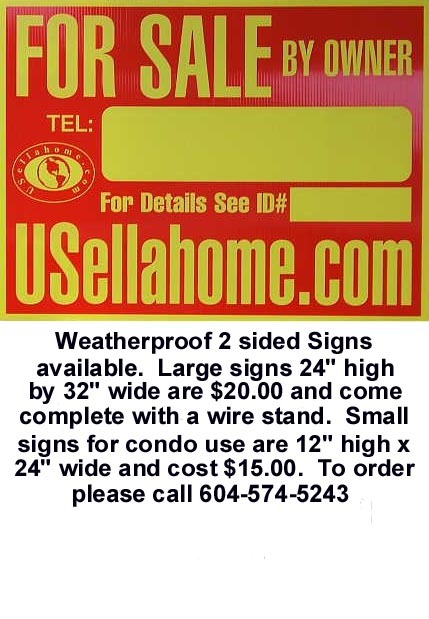 A uSELLaHOME.com representative will come to your home, take photos of it, and spend about an hour walking you through the For Sale by Owner process. At the end of the session, we will leave you a hand-out with many suggestions you probably never even thought of that will assist you in selling your home. One of our customers put $70,000 more in his pocket using uSELLaHOME.com than if he had utilized a realtor. Another customer put $66,000 more in his pocket. Two customers last summer had multiple bids on their property and they sold it for more than asking price. We have so many testimonials, that it is hard to keep updating them, the best recommendation we have is when the same people use us over and over again. It is amazing how often some people move. One customer has used usellahome.com 3 times in 6 years. We also have builders that use our services over and over again. Save Money!!! Let us help you advertise and sell your home by owner. We also have a business category for those wishing to sell their businesses by owner. Currently there are 51 businesses and 604 homes listed for sale by owner on our web site. Would you like to exchange homes for Vacation? Please check out our sister web site tradeahomewithme.com. If you don't see an authorized agent in your area, please inquire, you may be amazed at the opportunities that await you.